If you or a loved one has been injured by Tylenol, you may be entitled to financial compensation! Many health care professionals, doctors and consumer groups are calling for strong warnings on products containing Acetaminophen like TylenolÂ®. Submit your claim online today! You may be entitled to substantial financial compensation! The flu shot: To take or not to take? To take the flu shot, or not to take the flu shot?Â That is the question. I, for one, am personally tired of this flu shot being shoved down our throats.Â I don’t get the flu very often.Â I do get bronchitis at least once a year, but that is something entirely different, and the flu shot has nothing to do with that. About 5 years ago when I was working in a hospital, they wanted all employees to get the flu shot.Â I did not want it, but it was really being pushed.Â So I reluctantly got the flu shot.Â You know what happened to me?Â Within 48 hours, I came down with the flu.Â And it was the worst case of the flu I’d ever had in my life. The following year, my mom got her very first flu shot.Â Guess what?Â Within 48 hours, she came down with the flu.Â My mom and I both say we will NEVER get the flu shot again. It was explained to me while working at the hospital, that they actually place the flu virus inside you when they give you the shot.Â And somehow, that’s supposed to make you immune.Â Well, I’m sorry, it doesn’t work like that for me or my mom. This morning I got an email from my mom.Â My dad, who is almost NEVER sick, is home sick with the flu.Â So sick, he had to call in to work, which he never does.Â Â My dad works in management at a hospital, and employees were told if they don’t get a flu shot, they have to work wearing masks all day.Â So, my dad reluctantly got the flu shot.Â Last week.Â And today, bam!Â Flu.Â Â And my mom said she is now feeling symptoms of the flu, apparently passed on to her from my dad.Â Â My mom almost died last month (you can read about that here) and this is really the last thing she needs. I’m interested in knowing what your experiences are with the flu shot.Â Do you get one every year?Â Why or why not?Â Have you experienced similar results when getting the flu shot? Spa Week is 10/14-10/20! Find a $50 Spa & Wellness treatment in your area! Caring.com – find Assisted Living Facilities in your area. FREE month of Air Optix Multifocal contact lenses! Get a free trial certificate for AirOptix Multifocal contact lenses. Click the banner above for your free trial of lenses! I will tell you now – I have the worst case of arachnaphobia that you’ve ever seen.Â So when I was outside on our back deck and I saw a spider web and noticed this big mamba….. Being a blogger, the first thing I grabbed after screaming for my BF, was my camera.Â Â Â And then spider spray!Â This thing was SO huge! !Â Â There was no way I would tackle this thing myself, even with a dozen cans of spider spray.Â Â And it’s a good thing I have a really good zoom on my camera, because I did NOT get close to this thing to take pics. We live in Upstate NY, and I’m told we don’t really have poisonous spiders, but I beg to differ.Â I’m pretty sure we do.Â In fact, I treat EVERY spider as if it’s deadly.Â Â That’s because just the look of them can give me a heart attack. So, do you have any idea what type of spider this is?Â BF thinks it’s a type of wolf spider. Whatever it is, it is NASSSSTY! !Â And dead. If the BF was not here to kill this thing, I probably would have ended up burning the house down,Â lol. Have I mentioned I HATE spiders? Get a box of gluten-free food for just $12 shipped! Itâ€™s guaranteed! Sign-up and get ready for new taste sensations every month. It’s delivered right to your door–always with free shipping. It’s time you enjoyed gluten-free food! 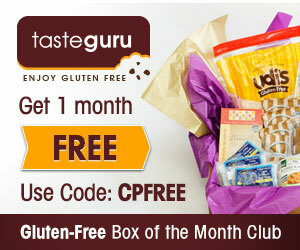 We founded Taste Guru, a gluten-free box of the month club, because it can be tough to find great-tasting, gluten-free food. We taste dozens of new foods every month, box up our favorite finds, and deliver them to your door each month with free shipping (after the 1st free box) plus the cost of food, which is lower than you can find in your local grocery store. We think it’s time you enjoyed gluten free! – We are like their gluten-free personal shopper! relationships w great vendors, small mom & pop shops and bigger vendors that give us the newest products out there.